‘A box within a box’, the symbol for A class 2 appliances. The PAT testing is executed in parts; firstly a visual check is executed, where we look for bare wires, cracked casing around plugs and sockets, and anything else that looks decidedly dangerous! We do visual checks because the machine that we use could pass an item as ‘safe to use’, but it’s physically dangerous to use if there is any issues with the electrical housing. The next thing is to determine which ‘class’ the item is in. A class 1 appliance is single insulated wiring, requiring an earth connection. This is usually if an appliance has a metal casing. A class 2 appliance is double insulated, not requiring an earth connection. A class 3 appliance is less commonly found, but indicates that it has a transformer supplying a low voltage. Class 2 items are extremely common in households and offices, and the small symbol to look out for is a box within a box. Earth resistance test- basically tests whether the earth cable it adequate to take the full possible amount of electricity that could go down it if a fault occurred. This is to ensure that the earth won’t melt or burn in case something goes wrong. Earth continuity test- you want to check there is a good earthing connection to the item so you don’t get electrocuted! The ‘earth’ is literally that. The earthing and power supply to your sockets comes from the power station/substations through a myriad of transformers. The earth is a large metal rod buried deep in the ground! Insulation resistance/ electrical current leakagetest – this is to make sure the resistance measurement is high enough to prevent power leakage between the live and neutral, which if the resistance is too low, could cause the item to blow up! Polarity test- making sure the live and neutral wiring from plug to socket is correct – you don’t want the live wire in the plug connected to the neutral in the socket! PAT testing is executed yearly on all the electrical equipment in spaces belonging to the museum, including galleries, offices and stores. Items that fail PAT Testing are either repaired or disposed of. You may or may not be surprised to find out that a number of museums still maintain electrical equipment that belong in a museum for its own merits and sadly these antique pieces are culled during the yearly testing. 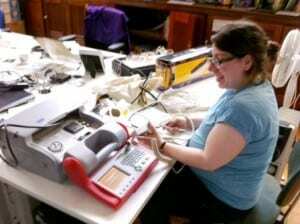 PAT testing is only a small part of the health and safety procedures that museums have to follow. Other procedures include: Risk assessments of Fire, Security, Hazardous materials but also risk evaluations of activities held within the museum. Maybe someone out there would like to tell us more about these specific risks? This is all very serious business and vital to creating a safe working environment for staff. But one can also have a lot of fun doing the PAT testing which to be honest is a pretty time consuming task; it took us 2.5 days to test about 200 items. Cross-departmental work is also always a great experience and I would like to thank Jo (and Syd) for teaching me (and everyone else) about the wonders of PAT testing.